Cornell bioengineers and physicians have created an artificial ear that looks and acts like a natural ear, giving new hope to thousands of children born with a congenital deformity called microtia. In a study published online Feb. 20 in PLOS One, Cornell biomedical engineers and Weill Cornell Medical College physicians described how 3-D printing and injectable gels made of living cells can fashion ears that are practically identical to a human ear. Over a three-month period, these flexible ears grew cartilage to replace the collagen that was used to mold them. "This is such a win-win for both medicine and basic science, demonstrating what we can achieve when we work together," said co-lead author Lawrence Bonassar, associate professor of biomedical engineering. The novel ear may be the solution reconstructive surgeons have long wished for to help children born with ear deformity, said co-lead author Dr. Jason Spector, director of the Laboratory for Bioregenerative Medicine and Surgery and associate professor of plastic surgery at Weill Cornell. "A bioengineered ear replacement like this would also help individuals who have lost part or all of their external ear in an accident or from cancer," Spector said. Replacement ears are usually constructed with materials that have a Styrofoam-like consistency, or sometimes, surgeons build ears from a patient's harvested rib. This option is challenging and painful for children, and the ears rarely look completely natural or perform well, Spector said. To make the ears, Bonassar and colleagues started with a digitized 3-D image of a human subject's ear and converted the image into a digitized "solid" ear using a 3-D printer to assemble a mold. They injected the mold with collagen derived from rat tails, and then added 250 million cartilage cells from the ears of cows. This Cornell-developed, high-density gel is similar to the consistency of Jell-O when the mold is removed. The collagen served as a scaffold upon which cartilage could grow. The process is also fast, Bonassar added: "It takes half a day to design the mold, a day or so to print it, 30 minutes to inject the gel, and we can remove the ear 15 minutes later. We trim the ear and then let it culture for several days in nourishing cell culture media before it is implanted." The incidence of microtia, which is when the external ear is not fully developed, varies from almost 1 to more than 4 per 10,000 births each year. Many children born with microtia have an intact inner ear, but experience hearing loss due to the missing external structure. Bonassar and Spector have been collaborating on bioengineered human replacement parts since 2007. Bonassar has also worked with Weill Cornell neurological surgeon Dr. Roger Härtl on bioengineered disc replacements using some of the same techniques demonstrated in the PLOS One study. The researchers specifically work on replacement human structures that are primarily made of cartilage -- joints, trachea, spine, nose -- because cartilage does not need to be vascularized with a blood supply in order to survive. They are now looking at ways to expand populations of human ear cartilage cells in the laboratory so that these cells can be used in the mold, instead of cow cartilage. "Using human cells, specifically those from the same patient, would reduce any possibility of rejection," Spector said. He added that the best time to implant a bioengineered ear on a child would be when they are about 5 or 6 years old. At that age, ears are 80 percent of their adult size. 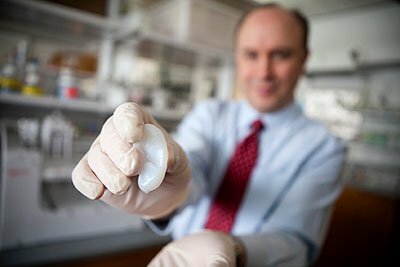 If all future safety and efficacy tests work out, it might be possible to try the first human implant of a Cornell bioengineered ear in as little as three years, Spector said.